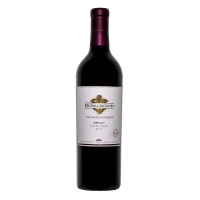 Primarily Merlot with a touch of Cabernet Sauvignon and a splash of Cabernet Franc, Malbec and Petit Verdot. Sonoma County mountain and hillside vineyards provide plum and black cherry flavors, and great tannins. A perfect option with grilled food & great company.